Most of us raise goats for meat or milk production as they are usually counted as a farm animal. But do you know that goat can be a great friend too? With a lifespan up to 15 to 18 years, the goat can be a good companion and an excellent pet too! Having a goat as a pet can be a good experience and an interesting hobby. But before choosing goat as a pet, you may want to consider these few things first! As a farm animal, the best place for goat is, of course, a rural area, or house with a decent amount of space or yard. If you live in the city, check out the laws and regulation in your neighborhood first because some may prevent you from having a goat in your home, some may allow you but with some requirements such as the limit of goat size and weight. Having a pet is your personal choice, but remember that goat also has special traits like it can be very loud. So make sure your neighbors are okay with it. Goats have a lot of breeds. Nubian or Alpine, for example, weigh between 100 and 200 lbs. Both counted as standard-size breeds. The mini-goats, like Pygmy and Nigerian dwarf, tend to weigh 100 lbs or less and use to be the popular one in urban areas that has a law with size and weight restriction. So choose wisely! Give some space to your goat! A mini-goat requires a minimum of approximately 135 square feet of room space. If you want to have the standard goat, you need twice from that with the square footage multiplied by the number of goats that you have. 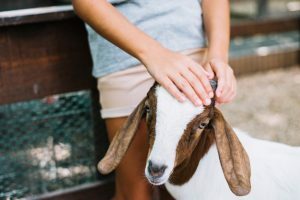 Whatever kind of breed you want to pick, you need a yard that provides space for your goat to play and sleep, with a part for the sun and part for shade and also the place needs to be protected from strong winds, extreme temperatures, and any predators. If you want to keep your goat indoors, your goat needs at least a 4’ x 9’ stall for comfort. You will also need to provide some place to store your goat’s food safely and a place to dispose of their soiled bedding. The windows around your goat should be higher than the head of the tallest goat when it is standing on hind feet or you should cover the windows with bars or screens so that your goat can’t poke its head through. The other thing that is important is about fencing. You need at least 4 to 5 feet high because goat is a good jumper. It needs to be reinforced with strong wood and sunk deep into the ground. All these works are to be done to prevent your goat heads from slipping through because somehow goat likes to rub its head into the fence. The fence also needs to be high enough to keep them in and prevent your goat to escape. You can also use wire, but make sure it is sturdy enough that it will not bend. It’s a pet! Of course, a pet needs a regular veterinary examination. Vaccination is also important to make sure you check the schedule up. Do not forget to de-wormed your goat twice a year and trim the hooves every 6 weeks. Disbudding, or removing the horns is also important so your goat will not injure itself, yourself, or others animal. You can get this done by a veterinarian and only after a few days old to minimize the trauma. Keep your goats away from prize rosea and ornamental shrubs like azeleas or ferns because these plants are toxic to goat. If it is needed, you can also talk to your veterinarian to find out what kind of plants you need to be concerned about in your area. Goat is a herd animal, so it should not be kept as solitary animals. Have some pairs to make your goat less lonely because goat is most happy when it has a company. Better for you have more than one. Goat tends to enjoy being petted, love to hang out with human companions and can easily learn to eat from your hands! Goats are curious, very social, may occasionally bite on your clothes. After all, goat is a good friend! You also need to provide a high level of protein grain and supplemental minerals, especially copper. You can find the component on loose powder or a compressed brick salt lick. And of course, your goat also needs plenty of fresh water. It drinks a lot! That’s all the important things you must know before having a goat as your pet. See? Having a goat as a pet can be an exciting journey for you. Remember that your goat is not a toy. It is also your friend and your part of family so treat your goat kindly.